This entry was posted on January 5, 2015 by seekraz. It was filed under Street Art - Graffiti and was tagged with Arizona, building murals in Phoenix, building murals in Salt Lake City, City Paint Phoenix, El Mac, graffiti, Kofie, Phoenix, photography, Salt Lake City, Salt Lake City Utah, street art. He does do very nice work. Yes, he does, Emilio…he’s done some rather incredible work…large-scale and beautifully presented. 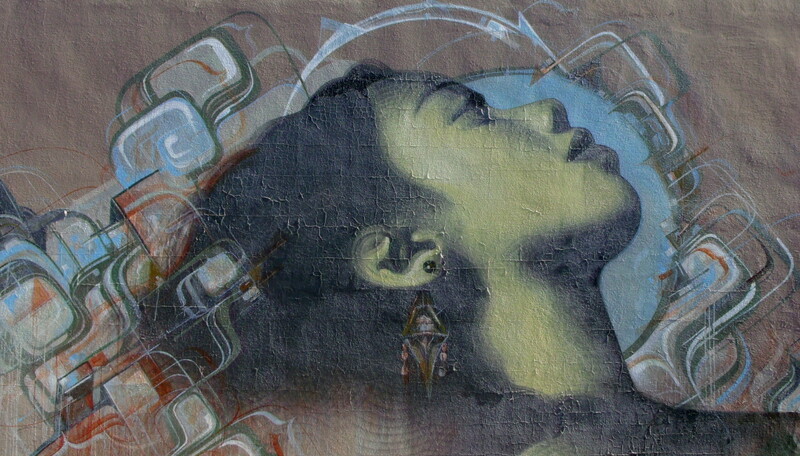 Thank you, Freeze Frame…the street art can be rather compelling. Amazing creativity and talent. I am counting the days (24) until my trip. Hopefully I will get to see some of the art in person. Thank you. I know I will be going to Phoenix on the 4th, my husband has a flight out. The areas I described are not too far from the airport if you’re able to spend a little time taking a tour. Too bad the weather is going to destroy it but I suppose that’s part of the package when you do these kinds of paintings. This particular mural has been up for five/six years already, and even though it’s faded and starting to peel, it is still an amazing piece of art…I love seeing it when I’m driving through the neighborhood….but, yes, Allen…that’s part of the deal with building murals like this. I have gone downtown a few times, but as a nature photographer it is quite daunting. 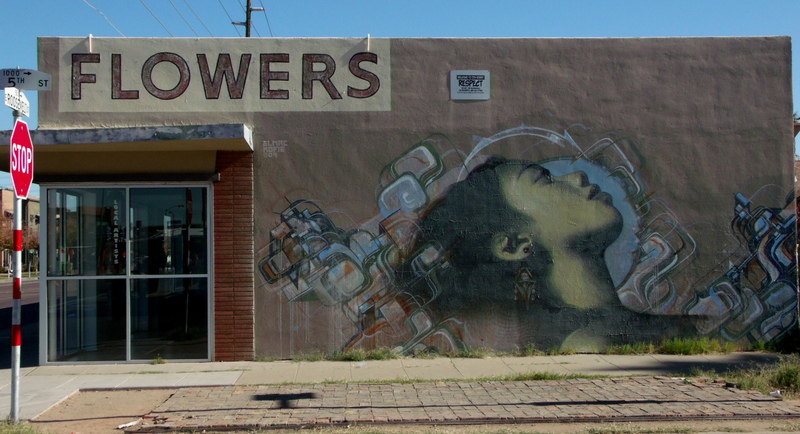 Beautiful mural, too bad the flower shop has closed. That’s really nice stuff! An art medium that began as graffiti long ago has legitimized itself now. How wonderful that you’re finding the street art that you love in your new/old home… Nice to see you adapting to the changes so well! Or so it seems. You probably know this but El Mac is from Phoenix, grew up doing graffiti on the streets so the fact that he is now an internationally acclaimed artist is remarkable. There are several other El Macs in town. If you’re interested, I can tell you where they are, or maybe you will come upon them in your wanderings. 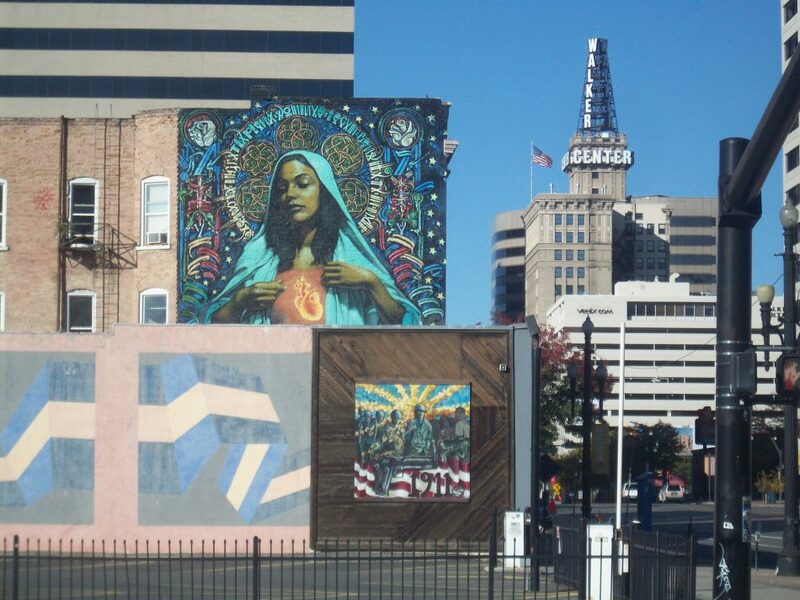 It’s considered basically a sin to paint over any of his murals although other murals are overpainted frequently. A couple years ago, new owners of a building that had one of his murals on it overpainted it much to the consternation and disgust of other muralists and the local art community. I have a photo of it on my blog since I had photographed it a few years ago. Hello again, Candace…and yes, I did know the El Mac is from the area…I researched him a bit after finding his name on this particular mural…and I’ve seen some of his other work and have already captured some images of them. I remember, what must be a couple of years ago now, when I was living in Salt Lake City and was posting murals from there, you mentioned that Phoenix had some great murals, too, and that it would be interesting to see them in a match-up….. I’d love to know of some of El Mac’s other location’s, too, so I can add images of those murals to the ones I already have.